Victorian moss agate cuff button, circa 1900. Vacation season is here! While acquiring new cufflinks for the gallery and following up with research into the history of cufflinks, I have found several days to enjoy the warmer water at the beach and head north to hike the mountains of New Hampshire. I hope everyone is enjoying an equally pleasant summer. Soon I will be posting several recent additions to the gallery and at the end of the month unravel the mystery of the Winged Bridge maker. 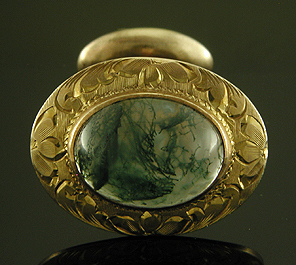 Until then I leave you with the above late Victorian cuff button set with one of my favorite gemstones - moss agate. The swirling green inclusions of this elegant variety of quartz are inescapably reminiscent of the seaweed beds I see while swimming at the beach. Recent additions to the Antique Cufflink Gallery include striking Victorian moss agate bean backs, a pair of Krementz roaring lions, Art Deco green and gold cufflinks from Larter & Sons and a mysterious Art Nouveau warrior princess from Link & Angell. Moss Agate Victorian moss agate cufflinks featuring a swirling tangle of green inclusions that brings to mind seaweed floating in filtered sunlight along the ocean floor. Crafted in 10kt gold, circa 1900. In the Antique Stickpin Gallery recent additions include a striking Egyptian Revival stickpin set with a bright sapphire from the Art Deco period.